This is Hal's Running Page index. See the links below for current running topics. Here's my schedule coming up. Send me email (see link at left) with more suggestions or if you want to join me. Up through 2016, my schedule was two full marathons per year (training with Team in Training, the Leukemia and Lymphoma Society) with a few half marathons sprinkled in. Now that I have gotten older, and 20 seasons of TNT training have gone by, I have decided to change to three to five half marathons per year. And since I am no longer training with TNT, I am no longer producing lengthy webpages regarding my training program. The details of the races will usually end up in my travel page. San Diego Holiday Half Marathon December 15, 2018 My 20th half marathon was a very easy course, sparsely attended and predominantly downhill, and I did moderately well despite running with a head cold. I finished with good strength remaining at 2:41:14, a 12:18 mile. This put me at 2420th of 2826 runners, 28th out of 34 in my elderly age group. Although it was an easy course, it was rather uninteresting. No bands or spectators. About 8 miles were on a bike path next to a freeway (CA 56), but it ended nicely at Torrey Pines with a beautiful ocean view. I did not bother writing a trip report, but Nancy and I used the race as an excuse for re-visiting Disneyland, the San Diego Zoo, and the San Diego Zoo Safari Park. US Air Force Half Marathon September 15, 2018 An easy course at Wright-Patterson Air Force Base, Dayton, Ohio. Overcast to start, but the second half was warm and humid. I did 2:45:52, 1869th out of 2794. My 19th half. Marine Corps Historic Half Marathon May 20, 2018 A fun race for Civil War fans in Fredericksburg, Virginia. Good overcast weather, but rather warm and humid. Only moderate hills. I did 2:45:01, which is mediocre for me, but I was amazed to see I finished 2640th out of 4215! My 18th half. Death Valley Half Marathon February 3, 2018 An excellent race through a beautiful, but desolate, landscape. Perfect weather ending in the lower 70°s. I finished at 2:36:02, 159th out of 206 runners, second in my age group! My 17th half. Gettysburg Battlefield Half Marathon November 5, 2017 A good race in dreary weather at one of my favorite places! I did a reasonable 2:39:25 in my 16th half marathon, but this has to be with an asterisk because a lack of course markings caused me to miss a turn and I actually ran only 12.62 miles. Sad! San Francisco Second Half Marathon July 23, 2017 I had been concerned that the knee pain problems I have experience over the last couple of months might cause me difficulty, but apparently they have passed. It was a good race, at least for the first 11 miles, but I regret to say that I pooped out for the last 2.1 or so. Unfortunately, my knee pain problem caused me to keep my training relatively restrained, so I did not do an adequate amount of mileage before the race. My time today was 2:47:52, which is not my worst, but certainly not my best half marathon, my 15th. Nashville Rock 'n Roll Half Marathon April 29, 2017 TNT #20 This was a nice course in a fun city, but high heat and humidity affected my time, 2:47:54. It was my 14th half marathon. San Francisco Rock 'n Roll Half Marathon March 26, 2017 This was a training run for Nashville. My time was 2:36:05. It was my 13th half marathon. Philadelphia Half Marathon November 19, 2016 TNT #19 I trained for the full marathon, but I fell back to the half for health and training concerns. A beautiful course in perfect weather, but a mediocre time of 2:48:57. This was my 12th half marathon. Freedom's Run Half Marathon October 1, 2016 Shepherdstown, West Virginia, across the Potomac and a loop through the Antietam battlefield. A training run before Philadelphia. 2:53 a poor time because of weather and hills. Seattle Rock 'n Roll Marathon June 18, 2016 TNT #18 A so-so course in ideal weather, but my periodic back problem returned and my finishing time was poor: 5:51:53. (But I'm proud I finished!) 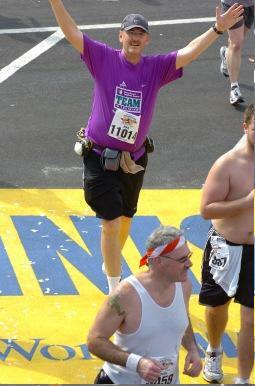 This was my 17th full marathon (and 15th successful completion). Star Wars Half Marathon January 17, 2016 A training run at Disneyland for me between full marathons. A slow start because of course congestion, finishing at 2:38:53, 4222th of 11,599. Richmond Virginia Marathon November 14, 2015 TNT #17 An excellent run on a beautiful day, slowly at 5:38:23, but the best news is that I completed the course that I failed in 2012. Montréal Half Marathon September 20, 2015 A serendipitous run while I was on vacation, which worked out well in my schedule as a training run. A dawdling pace of 2:38:34. Vancover BC Half Marathon May 3, 2015 TNT #16 A beautiful day in a beautiful city, 2:33:11. I only did the half marathon because a broken toe early in the season put a crimp on my training. Chicago Marathon October 12, 2014 TNT #15 A beautiful day and a strong performance for the first 23 miles, but a minor injury prevented another PR: 5:32:41. San Luis Obispo Marathon April 27, 2014 TNT #14 A personal record for a U.S. race, 5:29:16, on the same very hilly course that defeated me in 2013! New York City Marathon November 3, 2013 TNT #13 A very good race after two failed attempts, below. My time was not very good (5:48:22), but I was overjoyed to finish. San Luis Obispo Marathon April 7, 2013 TNT #12 This was my second failed marathon! This time I made it to mile 22 on a very hilly course before dropping out with back pain. Richmond, Virginia, Marathon November 10, 2012 TNT #11 I trained with TNT, but did this one on my own. It was my first failed marathon, dropping out at mile 18 with debilitating back pain. Oakland Marathon March 25, 2012 TNT #10 Another acceptable marathon on a very hilly course, 5:52. Los Angeles Marathon March 20, 2011 TNT #8 A terrible experience in heavy rain, my slowest finishing time (6:24) of any completed marathon. Marine Corps Marathon October 31, 2010 TNT #7 I trained with TNT, but I entered this marathon on my own. A great race, although a rather poor time of 5:43:19. San Francisco Half Marathon July 25, 2010 This was the second half of the full San Francisco marathon. Atlanta Marathon March 21, 2010 TNT #6 This was a very hilly course, but I did okay: 5:41:50. Kaiser Half Marathon, San Francisco February 7, 2010 At this time in my running career, I was doing these half marathons as training runs halfway through marathon training. That is something I generally don't bother with anymore. Royal Victoria Marathon October 11, 2009 TNT #5 This was my fastest marathon ever—5:20:19! Wine Country Half Marathon July 20, 2008 This was my fastest half marathon, 2:22:40, on a hilly, beautiful course. Disney World Marathon January 13, 2008 My only full marathon not run with TNT. My poor time of 5:59:14 was prompted by warm, humid weather and a noticeably shorter training period than in the other races in this list. Las Vegas Half Marathon December 2, 2007 I ran this less than two months after my first marathon, which is a shorter time for recovery than I currently plan for. Kaiser Half Marathon, San Francisco February 4, 2007 TNT #1 This was my first TNT-sponsored race and the longest distance I had ever run until then. It was also before I recorded web details of my training. Sorry, I was too disorganized to record web details of these, but I ran them during my TNT seasons. © 2016 Hal Jespersen. All rights reserved.